You are invited to join us for Good Friday! On Good Friday, we reflect on the ultimate sacrifice that Jesus made for us at Calvary. He willingly laid down His life for us—He was beaten, made to wear a crown of thorns, mocked, denied, and crucified. He endured it all so that we could live with Him forever in Heaven. 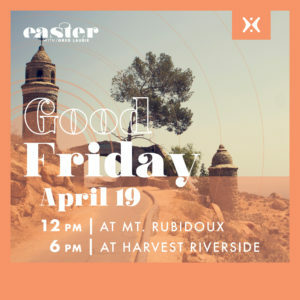 We need your help host this historic Good Friday service at Mt. Rubidoux.! If you can be there, please sign up here for communication and a free lunch that day. Volunteer briefing will be at 10:00 AM in the parking area at Ryan Bonaminio Park. Service will be held at noon at the summit.